Clinical Case Challenge: What Can You Learn from a Peripheral Blood Smear? Baci, a 6-year-old Labrador retriever presented for lethargy of a few weeks duration. Blood work performed by the referring veterinarian showed moderate anemia (hematocrit 26%; normal = 39-5%) and a positive reaction for Anaplasma phagocytophilum. He was started on doxycycline, but was referred to Cummings Veterinary Medical Center for further workup. On presentation at Foster Hospital for Small Animals, Baci was found to have mildly icteric sclera. Further workup included AFAST (abdominal focused assessment using sonography) and TFAST (thoracic focused assessment using sonography) which were negative for abdominal, thoracic, or pericardial effusions, such as might be caused by internal hemorrhage. Blood work showed a regenerative anemia (PCV was now 30%, absolute reticulocyte count of 156 K/uL; normal=14.7-113.7K/uL). A chemistry profile was normal except for a mild hyperbilirubinemia (0.4 mg/dL; normal = 0.1-0.3). 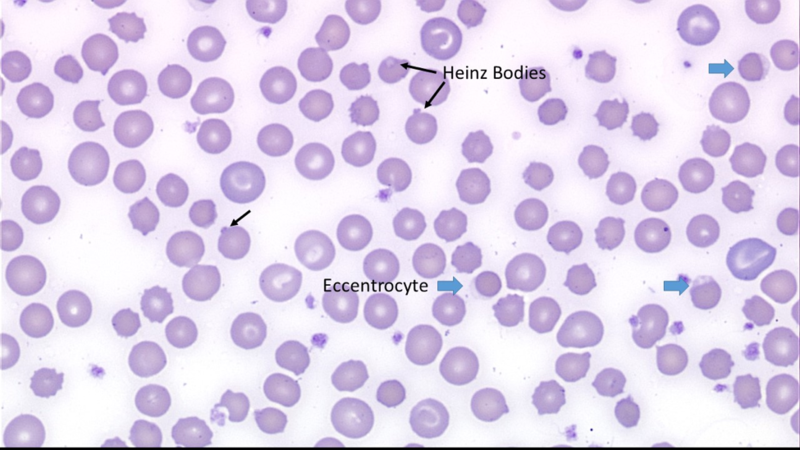 Microscopic evaluation of the blood smear revealed moderate numbers of Heinz bodies and low numbers of eccentrocytes. Figure 2: Wright stained blood smear, at 500x magnification. Heinz bodies are indicated by black arrows. Eccentrocytes are indicated by blue arrowheads. There are also several blue-tinged polychromatophils consistent with a regenerative response to anemia. Based on these findings, what are your differential diagnoses? What do you recommend as the next step? In an anemic animal, the presence of Heinz bodies and/or eccentrocytes indicates oxidative injury. Eccentrocytes form when oxidation of RBC membranes results in cross-linking of the membrane proteins. This leads to adhesion of the opposite areas of the membrane, with eccentric displacement of the cell’s hemoglobin out of this region (imagine stepping on one end of a balloon, pushing all the air to the other end). What remains of the oxidized membrane is a crescent shaped, very pale pink cap. These must be distinguished from blister cells (Figure 3), which contain a large, completely clear submembranous vacuole. These cells form following RBC damage and fragmentation. When the RBC membrane repairs, it can sometimes form a blister-like structure. Heinz bodies form following oxidation of hemoglobin sulfhydryl groups. This leads to distortion of hemoglobin’s tertiary structure, and precipitation of the denatured molecule. In some cases Heinz bodies coalesce into a large pale intracellular inclusion that distorts the RBC membrane and projects to one side of the cell. These are sometimes difficult to distinguish from membrane spicules, such as those found on crenated RBCs and acanthocytes. Examination of RBCs near the feathered edge may be helpful, since RBCs in this area are more fully flattened out and membrane spicules are often lost, while Heinz bodies should still be visible. Oxidation of the membrane can lead to a defect in the RBC membrane large enough for hemoglobin to escape into the plasma (intravascular hemolysis). When the thin oxidized membrane of the eccentrocyte ruptures, a small spherical cell which lacks central pallor and has a membrane tag is formed (pyknocyte). Like true spherocytes, pyknocytes are rigid and have a shortened lifespan, often getting trapped in the spleen (extravascular hemolysis). Heinz bodies also increase RBC rigidity, rendering them susceptible to entrapment in the spleen where they are phagocytized. In some cases, only the portion of the membrane with the attached Heinz body is removed by splenic macrophages or as they pass through splenic sinusoidal capillaries (pitting). 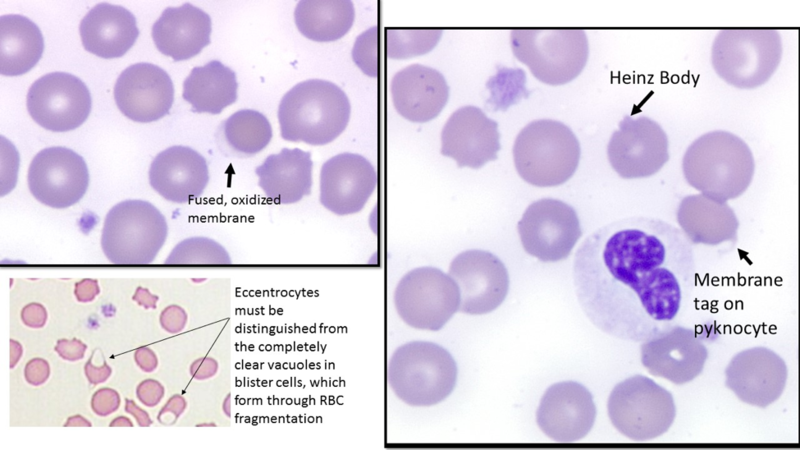 Depending on the amount of membrane removed, along with the Heinz body, the remaining RBC can appear as either a blister cell or a round, rigid, spherocyte. It is important to remember that spherocytes, which are often interpreted as indicative of IMHA, can also be seen with other, non-immune mediated causes of hemolysis. 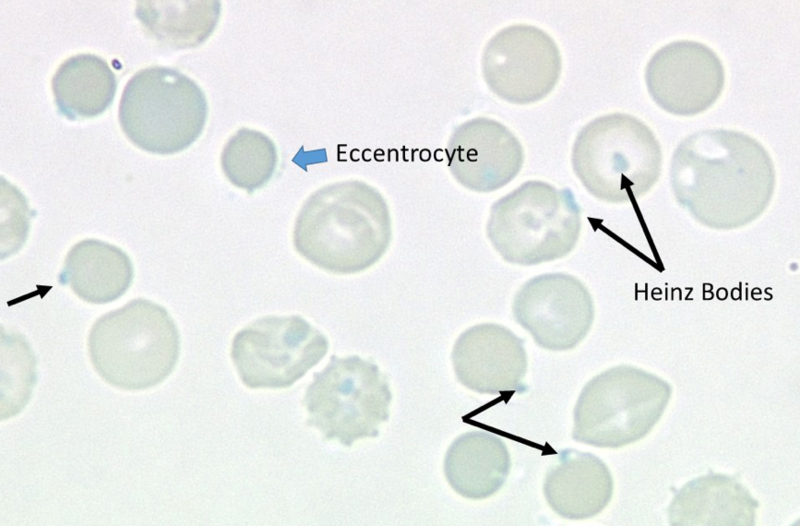 Figure 3: The images on the right and upper left show fields from Baci’s Wright stained blood smear, at 1000x magnification, illustrating an eccentrocyte, Heinz body, and a pyknocyte. The image in the lower includes 2 blister cells, which contain a large, completely clear vacuole that forms as a RBC membrane is folded as it passes fibrin strands in an abnormal vascular bed. In some cases, RBCs may contain several small Heinz bodies (rather than a single large one) and these are much more difficult to visualize in a Wright stained smear. Supravital stains, such as new methylene blue (NMB), as illustrated in Figure 4, can help to confirm the presence of Heinz bodies. Figure 4: Supravital stains, such as new methylene blue (NMB) can help to confirm the presence of Heinz bodies. One benefit of the “old school” NMB manual method for quantifying reticulocytes was the chance to simultaneously discover Heinz bodies. With the automation of reticulocytes counts, it is more likely that this important abnormality will be missed. Finding these RBC abnormalities should trigger a search for an oxidant. 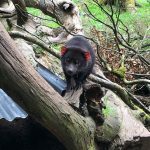 In dogs, differentials include ingestion of food containing onions or garlic, chemicals (zinc pennies or naphthalene moth balls), skunk spray and drugs (vitamin K1 or acetaminophen). Many sick dogs can have low numbers of eccentrocytes, reflecting RBC injury as a result of endogenous oxidants. In cats, low numbers of small Heinz bodies can be an incidental finding. 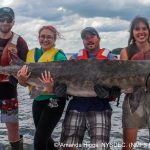 Increased numbers of, sometimes quite large, Heinz bodies are found in cats with diabetes mellitus (associated with ketone production), lymphoma and hyperthyroidism. 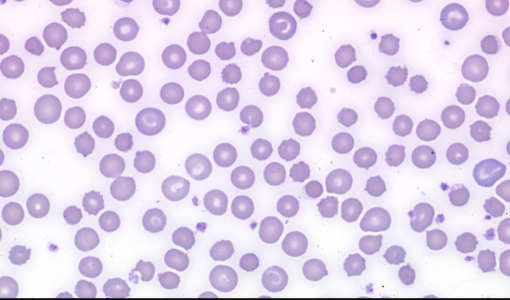 Although these cats are often not anemic, their hematocrits are frequently at the low end of the normal range as a result of shorted RBC lifespans. Acetaminophen, propofol, onions, garlic, and benzocaine have also been associated with increased Heinz bodies in cats. In Baci’s case, the clinical pathologist on duty immediately contacted the clinician to inform him of findings. A call to the owner revealed the fact that, about one week earlier, Baci had gotten into a cupboard and ingested a bottle of onion flakes. In most of these cases, elimination of the oxidant should resolve the anemia (absent damage to other organs such as potentially caused by zinc or acetaminophen toxicity). The fact that Baci’s PCV had already increased from 26% to 30% was considered to be a promising sign. Baci was subsequently treated with “benign neglect”, and returned to the referring veterinarian for monitoring of the PCV. It is important to remember that the duration of anemia can vary, depending on how efficiently the dog’s spleen is removing the abnormal RBCs. Heinz bodies/eccentrocytes may remain in the circulation for an extended period of time due to the dog’s long RBC lifespan (110-120 days). In one study using garlic extract (Lee K-W, et. al. ), the severity of anemia peaked at about 7-11 days after exposure, and while their RBC counts increased gradually over the 30 days of the study, they never completely recovered. The number of eccentrocytes and Heinz bodies peaked at 7-8 days, but small numbers of these abnormal RBCs remained present 30 days later. 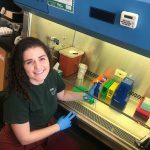 The Clinical Pathology Laboratory works closely with the multiple specialty departments at the Cummings Veterinary Medical Center to support our clinicians and ensure the best care for all patients, large and small. The laboratory is also happy to process samples for referral veterinarians. Clinical pathologists and experienced medical technologists also play a role in providing continuing education to clinicians and veterinary technicians. Caldin M, Carli E, Furlanello T, et. al. 2005. A retrospective study of 60 cases of eccentrocytosis in the dog. Vet Clin Pathol. 34(3):224-31. Lee K-W, Yamato O, Tajima M, et. al. 2000. Hematology changes associated with the appearance of eccentrocytes after intragastric administration of garlic extract to dogs. AJVR 61:1446-1450.